W5500-EVB is an evaluation board for the W5500 chip, based on a 32-bit ARM® Cortex™-M0 microcontroller. It is the easy way to develop an internet connection for efficient and small embedded systems by using the W5500, WIZnet's latest hardwired TCP/IP embedded Ethernet controller. 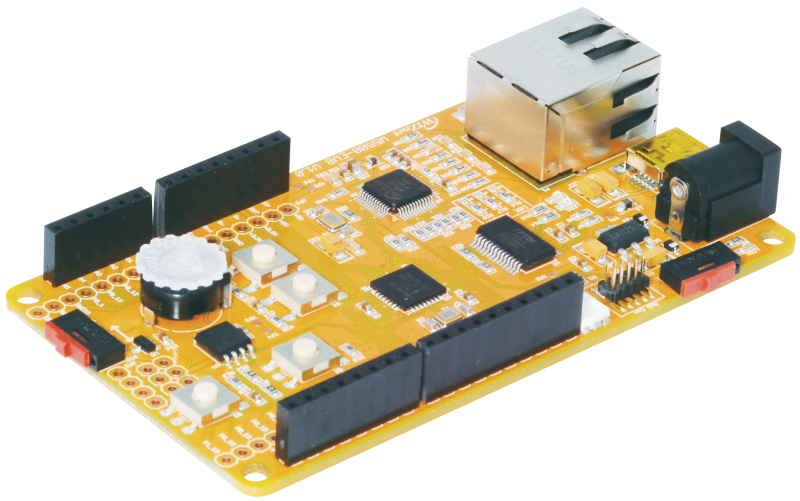 This EVB is designed to be hardware pin-compatible with 'Arduino shields' for the 'Arduino UNO Rev3'. The W5500-EVB includes the NXP LPC11E36 MCU with a 32-bit ARM® Cortex™-M0 core running at 50MHz. Additionally, 96kB Flash memory, 12kB SRAM, 4kB EEPROM and various interfaces, including SPI/SSP, I2C, UART, ADC, PWM and other I/O interfaces have been placed on the EVB. Furthermore, two programmable push button switches, one RGB LED, an external 4 MBit serial data flash memory and 10/100 Base-TX RJ-45 connector with transformer are on board to implement embedded networking applications. The W5500-EVB enables developing easy and powerful network applications on non-OS based and small form-factor embedded devices by using the W5500 chip.